for £9.00 postage paid world-wide. The BBC broadcast of the Symphony No. 1 Op. 15 from December 1976 required considerable restoration, but has scrubbed up well. It is of significant historical value in that it provides an example of the composer conducting his own music. The work dates from around the time Butterworth joined the Hallé. It had a lengthy gestation period, with initial ideas dating back to 1939. Preliminary sketches began ten years later, and a holiday in Scotland with his wife in the early 1950s spurred him to begin work on it in earnest. The craggy Scottish landscape and spectacular scenery helped shape its character, and it’s not difficult to find hints of the beginning of Sibelius’ Sixth Symphony in its opening theme. The first movement is rugged, with a Nordic feel, but beneath the surface is unease and even anger. The Lento is lugubrious and glacial with an overwhelming starkness. Butterworth’s skilful woodwind writing is very much in evidence. The Scherzo is a fairly gloomy affair too, and the finale enters with a whirlwind – a masterstroke of scoring. Its cascading chromatic scales conjure a picture of relentless and unremitting savagery. Apparently, one of its inspirations is the Northern winter weather, which I can certainly identify with. Barbirolli was impressed with the work and decided to premiere it at the Cheltenham Festival in 1957. It’s worth mentioning that there is a performance of the Symphony with Barbirolli and the Hallé from the Proms, Royal Albert Hall, London, dated 29 August 1958 and issued on a Dutton ‘twofer’ (CDLX 7212 - review). The first commercial recording was made by ClassicO where the conductor was Douglas Bostock. Paul Conway’s extensive and detailed annotations are excellent in every way. I see from the booklet that he is in the process of writing a book: "Moorland Symphonies: an introduction to the music of Arthur Butterworth". All the recordings are live BBC broadcasts, and have been sourced from the Itter Collection. These are appealing and engaging performances. 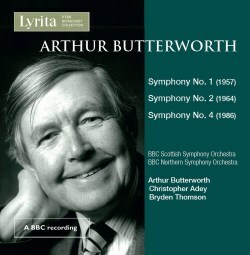 The initial 'flat' transfer of Butterworth's Symphony No.1 was impossible to listen to and we were on the point of rejecting it. The recording of the broadcast had at some point been badly processed, probably through the incorrect use of a dolby noise reduction unit. Richard Itter had professional dolby equipment for use with his Lyrita studio masters, perhaps he decided to use it on on this BBC Broadcast, it is quite possible that the surviving tape in his archive is a copy. Our restoration team - including Norman White, better known as Nimbus's Prima Voce archivist - manually rebalanced the frequency content of the recording. Had the BBC retained a copy in their archive we would have applied for a licence, but unfortunately in this instance there was no library copy.